Since the program was cut back in 2003, football at UMass Lowell has been all but forgotten. Even the field that was once built for the team bears no markings of the games once played on it. However, the team has not been completely forgotten. For Carmine Frongillo, a sports reporter for the Lowell Sun of 33 years, the games and the names of players and coaches seem to roll off the tongue. 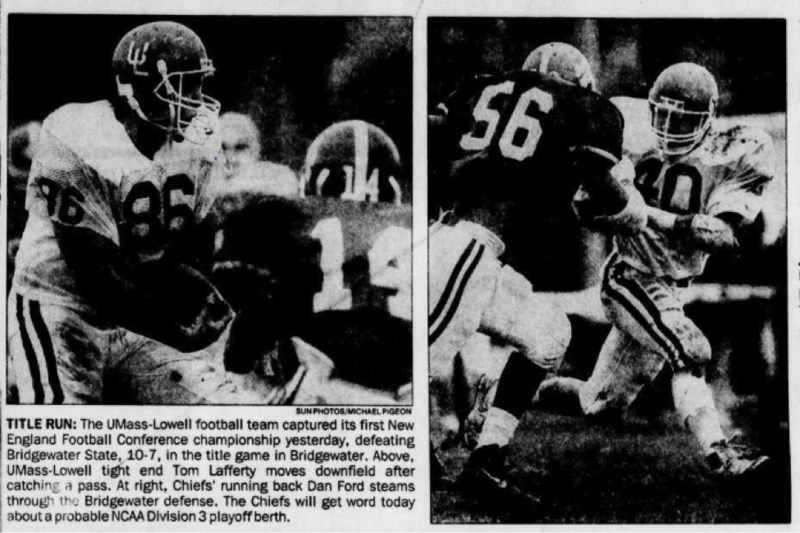 He recalls Billy Rizos, a quarterback from Lowell who led the team into the 1991 championship of the New England Football Conference (NEFC); Tom Lafferty, a tight end who the NFL had shown interest in until he suffered a knee injury; Scot Boyle, who would go on to coach Lowell High’s football team; and Denis Scannell, who coached the team for seven seasons. Football has a long history at UMass Lowell technically dating back 1905 when the Lowell Textile School’s team began playing. After two national championships in the late 1970s, the team would become Division III in 1980 and Division II in 1991 after Rizos led his team to the NEFC championship. For most of its existence, the team would share a home stadium, Cawley, with Lowell High School, though the team did spend some time in Lelacheur Park. Frongillo recalls that 1991 season and how the end zone was only two feet from the wall, players would run into it making catches. The seating was odd too. All the fans sat on the same side of the field and both teams shared a sideline. It was not until 2001 that the team would have the field on campus, Cushing field. Unfortunately, two years later the team would be cut to avoid having to cut multiple other sports teams, and in 2007 the university renovated the field into the Wicked Blue students recognize today.